While the weather looked dicey most of the day, it never even sprinkled, and the bucolic, hillside horse farm where Artemis (Nina) lives was the perfect setting for the Seattle Horse-athon. A six-year-old Trojan soldier named Aidan won the best costume award, edging out that beautiful bear Callisto (Marina). 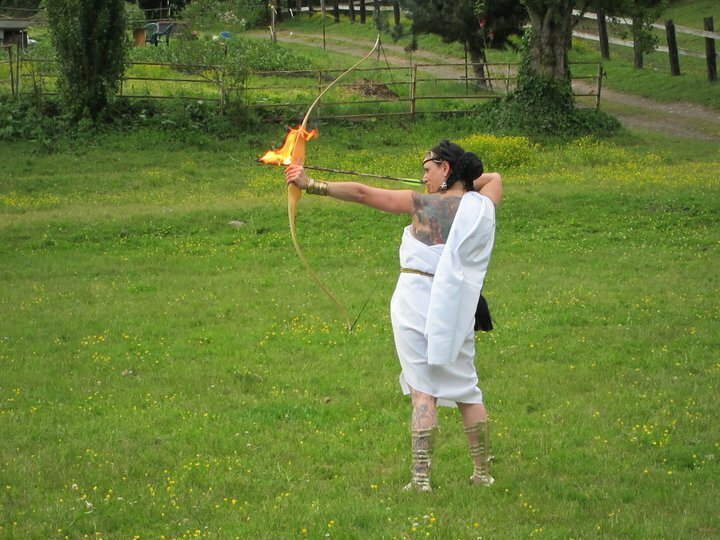 To win best performance, Artemis thrice shot flaming arrows through a hoop held by Eric (who never did get into his Homer costume). Even the horses kicked up their heels to the beats of DJ Wires, Amanita, and Osiris. As darkness descended, the fire spinners brought the evening to a close. Byron Go was the guy who made this party go. Hats off to him and to the kitchen crew for such great food. Lotsa photography/video soon to be posted. Posted on June 20, 2011 by trojan	in Updates and tagged artemis, event, Seattle.